Organize your job search and land a job. The job search is overwhelming enough, but by forgetting to follow up or misremembering an important detail, you can be overlooked for your dream job. Or any job. Instead, use Joustlist to organize your job prospects across all job sites. Track where you’ve applied, when you interviewed, and if you’ve heard back. Get reminded to follow up. Give yourself the best possible chance to land the best possible job. Using Joustlist is just like using a spreadsheet, so there’s no learning curve. 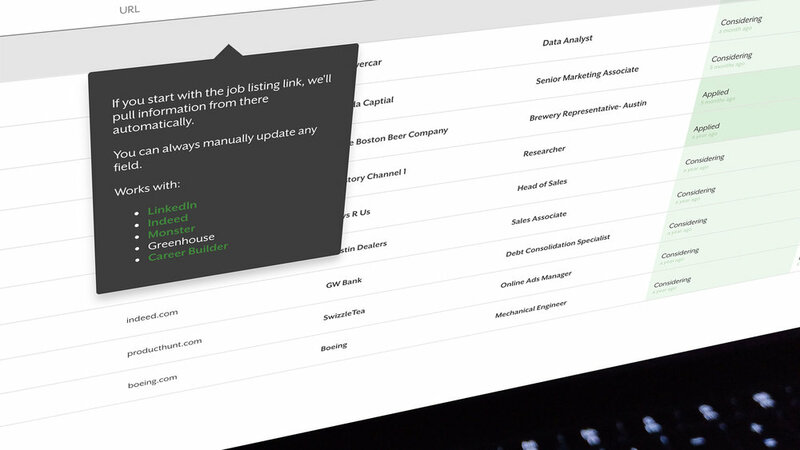 Job information is added automatically when you start with a job listing url. Joustlist sends you reminders and tips to help you stay on top of prospects. Add up to three jobs per day for free, forever. We only serve one audience- the job seeker. Our tools and insights are designed to put you first and to help you land your dream job quickly. We spent years as hiring managers taking advantage of all the hiring tools we had in front of us. We expected to have the same tools at our expense as job seekers. The lack of organization drove us crazy, and we knew we had an obligation to advocate on behalf of the job seeker. Sign up for articles, tips and updates.